Rescued by the Jersey British Divers Marine Life Rescue with help from the JSPCA, cared for overnight at New Era Vets and kindly transported to Guernsey by Blue Islands last week we are pleased to report that Andrew seems to be improving but he has a long road ahead of him. "If anyone spots a seal pup healthy or not we urge people not to approach them and to give us a call on 257261." 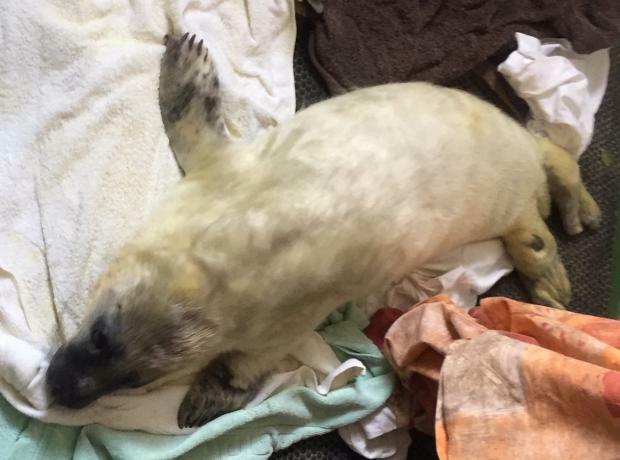 Steve Byrne continued "A healthy grey seal pup should look like a fat sausage and you shouldn't be able to the a neck, but if in doubt please send a picture in or give us a call." "Often healthy seal pups will have their Mother watching them from out at sea and it is people that has scared them off, so please do keep your distance and your dogs under control." Every Autumn the shores of the Bailiwick see grey seal pups being born. The earliest grey seal pup we have rescued in recent years was Temperance who was found during the last week of October last year. To see some of the previous stories about seals please click here.